I am filled with gratitude to have been one of five interns working for the Sierra Leone Red Cross Society (SLRC) this summer. The SLRC has the vision to inspire, encourage, facilitate and promote at all times all forms of humanitarian activities by National Societies, with a view to promote and alleviate human suffering, and therefore contribute to the maintenance and promotion of human dignity and peace in the world. The SLRC works collaboratively with the Ministry of Health, other NGOs, INGOs, and line ministries to help prevent the further deterioration of the already fragile health care system. As an intern, I work with the department of the Community Based Health Program at the Society’s headquarters in Freetown. 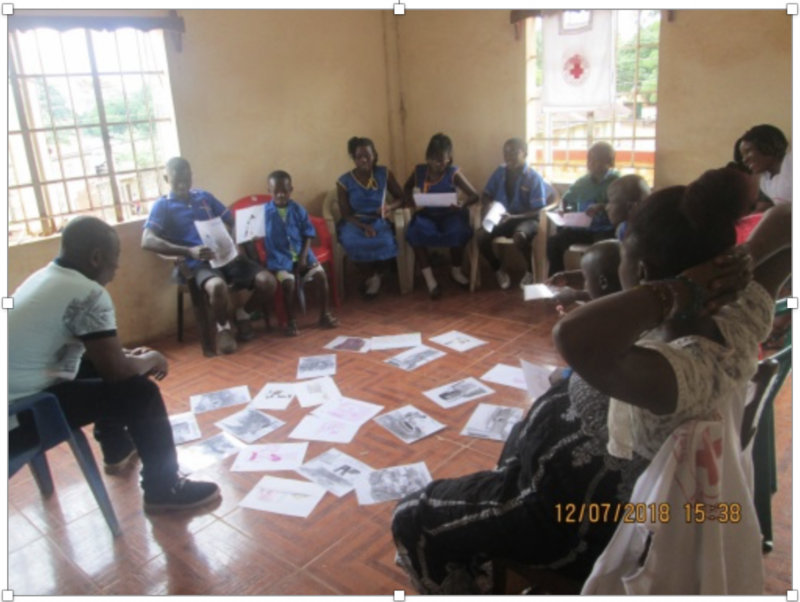 The Community Based Health Program (CBHP) considers key public health risks and priorities in Sierra Leone focusing on the prevention and control of communicable diseases and reproductive, maternal and child health – with emphasis on adolescent, especially, teenage pregnancy. The CBH Program functions primarily through community volunteers who assist the SLRC with perpetuating safe and hygienic practices within communities to help minimize the occurrence of outbreaks within communities. Other methods of implementation include youth peer education, health campaigns, and establishing community action groups. At the department, I work closely with the Coordinator of programs and gain first-hand experience in project planning and management, health activism, and health promotion. As a CBHP intern, I am involved in fundraising activities to support ongoing projects. This summer, the department takes on sensitization efforts to help combat a current measles outbreak in one of the nation’s 14 districts, Koinadugu. I am part of a team of five that organizes and reports on the ongoing community meetings and home visits for the sole purpose of sensitizing community members on personal hygiene practices, water and sanitation hygiene, and modes of transmission of the disease to help prevent further spread of the disease. I got to engage in cross-cultural communication as these communities constituted people of a tribe, language and way of life that was significantly different from mine. I also got to experience health promotion and outreach in a rural setting. I was exposed to some of the challenges health professionals face in this part of the country, such as issues with communication strategies to ensure the desired message is disseminated, and adaptability with implementation strategies as the health scene is constantly changing, and so is the field of public health. Lastly, I was fortunate to be present at one of the PHAST (Participatory Hygiene and Sanitation Transformation) training and Child Hygiene and Sanitation Training (CHAST) of community volunteers in the rural parts of the west end of Freetown and the northern parts of the country. It was a period of great inspiration as I got to be a part of strong men, women, and children who have so little but are willing to give so much to bring about change within their communities. To future interns, the internship search process can be tiring and frustrating, start the application process early, reach out, and if you are rejected the first few times, do not let that slow you down. And when you finally get there, in addition to performing the task adeptly, immerse yourself into the respective culture as it is all a part of the experience. I am grateful to have had such a wonderful opportunity, to be a part of something so motivational, all thanks to Skidmore’s summer experience fund. The CBHP internship introduced me to public health research and helped me improve my communication, analytical, problem-solving, and interpersonal skills which I hope to leverage in pursuit of a career in Global Epidemiology. This entry was posted in Africa and tagged Freetown. Bookmark the permalink. The Career Development Center is excited to share some of the awesome experiences students have received funding for over the years! In celebration of the Career Development Center’s 10th Anniversary coming in 2018, we are thrilled to share these experiences with students and the entire Skidmore Community. This blog is one way we are able to communicate the wide range of opportunities students engage in each summer. Due to the wide range of experiences that funding covers, we have changed our name to CDC Summer Experience Fund (SEF) (formerly the Skidmore Summer Funded Internship Awards Program – SSFIAP). Initially students find their own summer internship, research, volunteer, or community service experience either on their own or through the many resources the Career Development Center has to offer, and then they apply for funding through Handshake on the Career Development Center’s website. If you are a Skidmore student interested in applying for an unpaid internship, research, volunteer, or community service project, please stop by the Career Development Center to learn how you can apply for funding to create your own amazing opportunity next summer. Cambel Iribuka, 2020, New Settlement’s College Access Center, Bronx New York. Gabi Morris-Flores ’20, Office of Congressman Jamie Raskin, Washington, D.C.
Gabi Morris-Flores ’20, Democracy Summer, Washington, D.C.
Sophia Hettler, 2020, Saratoga Springs, Office of Sustainability and Planning at City Hall.